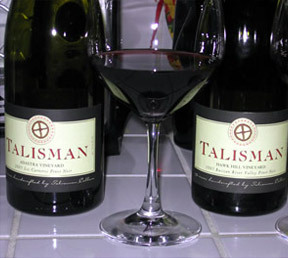 Scott Rich, founder of Talisman Wine, had his first exposure to winemaking at age 6 in the home of Greek friends who made wine in their Salt Lake City basement each year. He attended graduate school in the enology program at U.C. Davis and has worked as a research enologist for both RH Phillips and Robert Mondavi. He has been winemaker at Mont St. John, Carneros Creek, and Etude, where he made highly-acclaimed Pinot Noir and Cabernet. Currently, Scott's time and energy are spent as winemaker/owner of Talisman, as well as winemaker for Moraga Vineyards in Bel Air, California. Moraga produces sought-after Cabernet Sauvignon and Sauvignon Blanc. Marta Rich actually has no memory of life without wine. Her father made wine in their Minnesota basement, using virtually any form of grapes or juice he could get. Yearning for warmer climes and more interesting terrain, Marta fled for the University of Colorado at Boulder, where she earned her degree in Psychology. After taking up residence in Napa Valley, Marta began an 18-year stint at Robert Mondavi. She worked her way up the ladder, first scheduling grapes during harvest and eventually running Robert Mondavi's Northern California sales team. She was well-prepared for her next tenure; 14 years as VP/Director of Global Sales for Calera Wine Company, one of California's Pinot Noir pioneers, and now happily dedicates all her time to the role of Director of Sales & Marketing for Talisman Wine. Together, they happily zip around in their travels, spreading the gospel of Pinot Noir to anyone who will listen. Quality, artistry, and promoting pleasure are their key objectives. In their spare time, they ski and play in the outdoors. Download a concise and convenient Overview of Talisman. 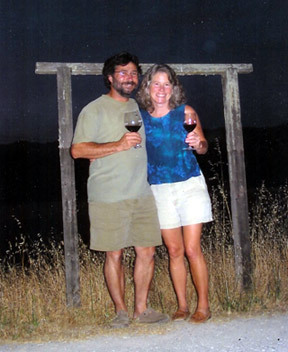 Click here for articles about Scott's winemaking.